There is an all out assault taking place in nearly every community against private property ownership. It's being perpetrated at every level of government and funded by taxpayer grants. Yet few property owners raise objections, mainly because today most don't have the basic understanding of the right of property ownership and its vital place in preserving our nation's prosperity, economic stability and foundation of freedom. Most Americans tend to think of private property simply as a home – the place where the family resides, store their belongings and find shelter and safety from the elements. It's where you live. It's yours because you pay the mortgage and the taxes. That's about the extent of thought given to property ownership in today's America. There was a time when property ownership was considered to be much more. Property, and the ability to own and control it, was life itself. The great economist, John Locke, whose writings and ideas had major influence on the nation's founders, believed that "life and liberty are secure only so long as the right of property is secure." Homeownership, and the equity it creates, has been the main source of wealth for millions of Americans. It's the reason the United States was able to build incredible wealth and rise above much older nations. 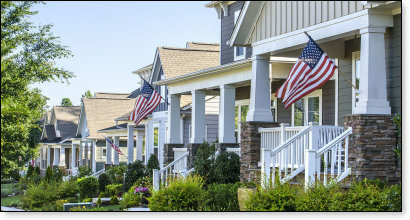 Sixty percent of American businesses were created by homeowners using the equity from their homes. Where private property is disallowed teeming and unrelenting poverty is the result. Locke's fears have become reality today through the innocent sounding term called "Sustainable Development. Under that banner, the very concept of property rights is being targeted as unrealistic in a drive to reorganize our communities through strict planning regulations. Proponents define Sustainable Development as: "Development that meets the needs of the present without compromising the ability of future generations to meet their own needs." According to its advocates, to achieve that goal requires massive amounts of land and natural resources to be permanently locked away from use; which translates to control, not conservation, as many perceive it to mean. The best known form of the Sustainable transformation is called Smart Growth. We're told this policy is necessary to create the community of the future, to guarantee effective planning, and, most importantly, to protect the environment by reducing our carbon footprint to combat climate change. Attending a local public meeting where the community's new "visioning" plan is being promoted, citizens will be assured that everything has been prepared by local leaders simply to address unique problems and well-laid plan for the future. However, a little research will show, ironically, that almost every community in every state has a nearly identical plan in process, usually ending with numbers like 2030 or 2050. One can also search the Internet and find such plans as Jamaica 2050 and Dubai 2050. They cover the world and most importantly – they are all the same basic plan no matter where they are, nationally or globally. One thing they all have in common – none of them are LOCAL! Across the United States, most of these plans are being implemented by the same associated planners, fueled by the same grant programs, and aided by the same non-governmental organizations (NGOs). Working in well-oiled teams, they cover the nation, reaching out to local and state officials to promote the programs. Each of these NGO groups has their own specific programs to promote, such as bike trails, conservation easements, or energy conservation, and they bring the grant programs with them for the local officials to apply. It's mostly done in backrooms, out of sight of the general public. Unseen hands dig in to decide the community's future. As a result, there's a near endless number of programs and processes being used in cities across the nation to impose the plan. Most are funded by federal grants with specific strings attached, in particular from HUD, EPA and the Department of Transportation, that assure the sustainable policies are enforced. The sales pitch is for a perfect lifestyle in what they call healthy, happy communities – where neighbors interact, parents play with their children, and there is no stress from long commutes because all the conveniences of living are just a walk down the street. It all sounds so warm and wonderful, creating images of a near Eighteenth-century atmosphere of peace and tranquility, yet with all the conveniences and technology of our modern age, leading toward a "sensible growth plan" for future development. The main enemy of the dedicated Sustainablist is the automobile. To them "urban sprawl" is the breeder of cars. The sustainable planners, like the American Planning Association (APA), diligently devise new schemes to get people out of their cars as the first role of Smart Growth. That means the focus for future housing will be the establishment of high-density neighborhoods with residents living in high- rise condos. Walkable communities, as the Sustainablists call them, mean the use of private cars will be discouraged in favor of public transportation, bicycles, or walking. How is that done? Higher taxes on cars and on gasoline – and there are now plans being developed in various states to tax every mile you drive. Your mileage is kept in the computers of today's cars, like the black boxes on airplanes. Mandatory auto inspections by the state will provide the opportunity to read that information, determine the number of miles driven and a bill will be sent to the car owner each year. Form-based code "is a means of regulating land development to achieve a specific urban form." According to their own literature, form-based code is a plan for regulating the form, scale and character of buildings. It coordinates floor area ratios, dwelling units per acre (Smart Growth pack-em and stack-em condos), parking ratios, and more. It assures all buildings are consistent and predictable as they are the same size and design, with the same set-backs, plantings and functions; in short, it prevents any distinctions in buildings. Basically, all communities will eventually look exactly alike. There's little room in Smart Growth cities for single-family homes. What Works Cities are located in every region of the United States. This NGO operation supplies communities with workshops, training, data, and all the information needed to guide your city into the "right" programs that work. By adopting the WWC Standard, the community becomes part of a national network of local governments. In short, they will be fully invaded by armies of NGOs to help them "do it right!" Of course, all WWC policy is based on Sustainable Development programs. New York City implemented what is called "progressive street projects." They built more than 400 miles of new bike lanes, and they created a massive pedestrian plaza in Times Square by closing five blocks of Broadway to cars. The announced purpose was to "change the culture." The pedestrian plazas are placed in the center of what were once busy streets, blocking off traffic, and, again, making it difficult to drive in the city. One of the leaders of this project said, "What we're trying to do is see equity of public space. When you build your streets for cars, you're actually building in the expectation that people are going to have cars." So, if you stop having streets, obviously people will stop wanting cars. Today, such ideas are considered radical, old fashioned, out of touch, and even reprehensible. The homeowner can be arrested for defending against an armed intruder who can actually sue a homeowner for shooting them even as they break down the door intending to rob and do harm. Home protection is called violence, perhaps even racism. It's a new world of compliance, fear, and acceptance rather than pride, protection, and prosperity in ownership. This definition speaks specifically to the right of use of the property. It does not infringe on government's ability for local rule or to impose reasonable, legal zoning policy, so long as such policies recognize and protect the owner's use of their private property. The very idea of "unrestricted right of use" by the property owner terrifies the powers in charge as they race to control every inch of land and its use. The result is that private property rights, according to Justice Sander's definition, have indeed become a "barren right." Private property ownership and the right to its unrestricted use are vital to the preservation of freedom, prosperity and independence. It's urgent that every American fully understand the purpose and recognize the players in their local planning schemes before our entire society is completely transformed to their agenda.